I’ll discuss each point briefly. The primary benefit is that they instigate sweating to deeply cleanse the body of chemicals and metals. In an online article, DAN! Doctor Lynne Mielke said, “We know that children on the autism spectrum are genetically “poor detoxifiers”, so they are often more affected than most by the toxic soup. We can chelate heavy metals such as mercury out of the body, but we cannot chelate chemicals. They are harder to remove. Fortunately, there is a safe and natural way to remove toxic chemicals from your body. It is called Far-Infrared Sauna Therapy. I’ve underlined Dr. Mielke’s concluding phrase as it underscores the significant and unique value of saunas. Her statement reminds me of one made by Dr. Woodhall Stopford, Duke University Medical Center, in an article published in “Biogeochemistry of Mercury”, which I’ll also underline: “By far the earliest known form of therapy (to enhance mercury excretion), and possibly still the most effective, is the induction of sweating by the use of sauna or steam baths." Dr. Stopford used a dry sauna clinically. Saunas boost immune activity. Researchers know that elevated body temperatures can stimulate the production of interferon and T-cells (white blood cell that fight off bacteria), increase enzymatic activities, trigger antibacterial and antiviral responses, and instigate the release of protective heart shock proteins. 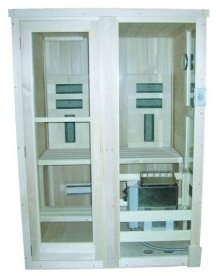 Saunas utilize the body’s eliminative functions by inducing a state of mild hyperthermia. That simply means that the sauna raises body temperature like a very mild fever does. Interestingly, many parents have reported that their autistic child’s cognition and eye contact improves noticeably when they have a mild fever. The sauna induces what could be described as a brief, light, artificial fever. Hippocrates, the Father of Medicine, said: “Give me a fever and I will cure any illness.” For centuries, various cultures around the globe have used one form or another of sauna detox as a means of physical cleansing, spiritual purification, and renewal. The primary aim of the body’s response to heat stress is to protect the nervous system and the vital organs from overheating. Circulatory changes are pivotal to this response. Warming blood is shunted outwards, away from the vital organs of the “core”, to the periphery, where blood vessels dilate to accommodate a suddenly increased load. The surge in blood flow facilitates waste removal from tissues while improving the delivery of oxygen, nutraceutical agents, and vital nutrients to the cells. The increase in blood flow is very substantial, estimated as typically 2-3 times that of the resting state. This dramatic enhancement of the blood’s cell-delivery function may be the key to sauna bathing’s potential synergistic value with other modalities. One possible combination treatment that several DAN! Doctors are looking into is saunas and hyperbaric sessions. In her article, Dr. Mielke said, “Sauna therapy can be done alone, or is possibly even more effective after a session of hyperbaric oxygen therapy, which helps rev-up the metabolism and the detoxification machinery with oxygen, after which the sauna helps to “sweat it out”. I recognized my older Autistic son has not benefitted from natural excercies that would have created sweat because of his coordination issues. We looked into public sauna's but the social issues made that difficult also. I am so glad to see that sauna's can safely be used in the home now. We look forward to singing the praises of the benefits the more we get to experience them. I have heard that saunas are the only way to detox from organophosphate toxins. My son was exposed to a lot of Diazinon pesticide as a baby. We had 3 large dogs that carried it in on their feet from our Texas backyard and then the baby crawled all over the same floor. Saunas are yet another thing we need to keep in mind. I think these saunas are an underutilized tool in treating ASD. As a DAN! doctor, one of the biggest obstacles I face is killing viruses. In fact we don't even have reliable testing for most viruses. Children with ASD have somewhat compromised immune systems. The boost in immune function by infrared saunas can really be very effective in eradicating the body of toxins, chemicals and VIRUSES! They may also be of value in patients that have Lyme disease. I always recommend the sauna after a HBOT session to get the most out of both therapies. It is great to see people are moving forward finding other ways to further help children’s progress.